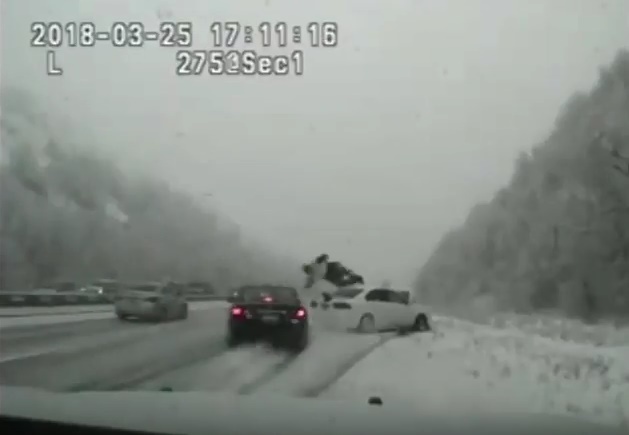 Dashcam footage from a Utah Highway Patrol trooper’s vehicle shows the officer on foot as he approaches a car that slid off the highway in Sardine Canyon, when he is suddenly hit from behind by another car that was skidding on the ice and launched into the air. On Sunday, Sgt. Cade Brenchley became the 11th state trooper to be hit by a car in 2018, while a total of 10 troopers were hit in all of 2017, according to the Utah Department of Public Safety. After he was hit, several passersby stopped to render aid to the trooper and called for help, including the driver who hit him. Among the first responders to the scene were three of Brenchley’s cousins and a couple of childhood friends, he said. He suffered four broken ribs, a broken shoulder blade and road rash on his face, the Salt Lake Tribune reports.